The Pacific Northwest, particularly the Puget Sound, is surrounded by water. Living in Tacoma, Washington, I can pick and choose from an abundance of outdoor venues in any direction. I like camping and hiking. One of my favorite campgrounds around Puget Sound is Kopachuck State Park in Gig Harbor. Just across the Tacoma Narrows Bridge, heading West on Highway 16, is home to Kopachuck State Park. The Park has campsites that are fairly private, and nicely shaded, a large playfield for the kids and an open area for playing tag, volleyball, touch football, or a game of baseball. The paved roads that whine through the park are great for bicycling and riding scooters. Amenities include a shower. There are trails and a gravel path where you can hike down, down, and further down to the water’s edge—Henderson Bay. You get quite a different perspective of the Tacoma Narrows from down below—it’s a marvelous structure. Enjoy expansive views of the Olympic Mountains and Puget Sound. The hike back up is a fitness challenge. Never fear, the park system has placed benches along the way so you can take a rest break. It is a great place to just stop, close your ears and get lost in thought. Cocooned amongst the trees, with the squirrels and chipmunks scurrying about, and birds singing you a melody, life doesn’t get much better. Early morning hikes are the best if you prefer solitude. If you are not a camper, but want to picnic and/or hike, there’s a large parking area below the campgrounds, with picnic table nearby. Kopachuck State Park is located in Gig Harbor, a scenic coastal city. If you are in the area, you will enjoy shopping near the marina and great waterfront restaurants. You can rent bikes and kayaks. The Olympic Village has some wonderful shops. I was camping one weekend, and camp to the shopping village for some supplies. I have always enjoyed shopping at Ace Hardware stores, but I’d never experience a store such as the one in Olympic Village-Point Fosdick. I walked inside this store and I was hooked: kitchen accessories, gifts and glassware, not to mention garden accessories. And of course, they had everything on my list for camping and more. Just across the freeway from the Olympic Village is the local Farmer’s Market, is open on weekends. The best route to the park is by following Rosedale Street. About two miles down the road, you’ll come upon Rosedale Gardens (7311 Rosedale St. NW, 253-851-7333). Stop. Regardless whether you like flowers and shrubs, the gardens are a whimsical and beautiful place to spend an afternoon. This nursery truly is “the art of nature”. Throughout the years, I’ve watched this nursery grow into a spectacular outdoor art gallery. There’s yard art, one-of-a kind yard furniture, ponds nestled along trails that whine through over 15 acres. Enjoy beautifully landscaped grounds with waterfalls. Shopping is plentiful. The gardens have a large selection of bird houses and feeders, and a gift shop full of specialty items for your home and garden. 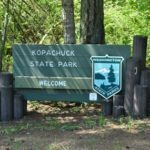 Kopachuck State Park is in danger of closure due to budget cutbacks. A group called Preserve Our Park is gaining support to help save Kopachuck. It would be a tragedy if this park is closed down. Kopachuck will be 105 years old in 2017.